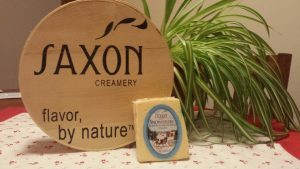 We at Saxon Homestead Farm are excited to announce that Saxon Creamery’s Snowfields- Aged Butterkase cheese was awarded the top honor of Cheese & Butter Grand Champion at the 2016 World Dairy Expo Championship Dairy Product Contest. This year’s contest received an unprecedented 1,130 entries of a vast array of dairy products from around North America, including cheese, butter, yogurt, cottage cheese and ice cream, to name a few. Last month, Saxon Creamery also took home ribbons for its artisan cheeses at the American Cheese Society (ACS) contest on July 29, 2016. This year’s contest was one of the largest in ACS history with 109 categories of cheese, 260 cheese companies competing and 1843 entries submitted. Saxon Creamery’s first-place winners at the ACS contest included Saxony Alpine Gruyere (Class DC) and Asiago Fresca (Class HD). The Snowfields Butterkase with chilies and mushrooms (Class KC), a limited quantity and pre-order item, received a second-place ribbon. Finally, the third-place winners were Snowfields Butterkase (Class DC) and Saxony Alpine Gruyere, young (Class DC). The class “DC: Open Category- American Made/ International Style- made from cows milk” was one of the largest classes. Saxon Creamery had six entries in this class and earned three awards: one first-place award and two third-place awards. Saxon Creamery cheeses are made from milk produced from one herd of cows on our farm. Our family and our employees are dedicated to producing exceptionally high-quality milk. 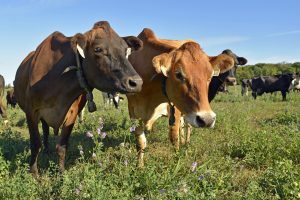 We are proud to say our Holstein-Jersey cross-bred cows are pasture grazed and are not treated with bovine growth hormone (rBST.) The pasture production system adds unique flavor characteristics to our milk and, consequently, to Saxon Creamery cheeses. Saxon Creamery, which opened in 2007, hand crafts artisan cheeses one wheel at a time. Saxon Creamery strives to create high-quality, great tasting cheese and is Safe Quality Food certified. The creamery’s licensed cheesemakers have more than 25 years of combined experience. Furthermore, its team members age Saxon Creamery cheeses to perfection and take pride in packaging and shipping the cheese to ensure their customers receive the very best. Moreover, Saxon Creamery has a dedicated support and sales team that strives to service and understand each customer’s needs. With pride and gratitude to all the people that love Saxon Creamery cheese, we encourage readers to continue indulging in the family of award-winning cheeses and to feel good about doing so! Remember, it all starts in the pasture.